Carroll Hardwood is structured as a continuous-flow job shop, so our process is specifically designed for quick changes and custom specifications. 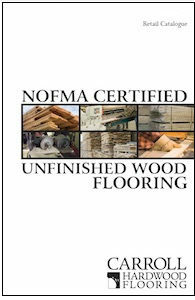 We can supply special widths—1 ¾” and 2” to match flooring from the early twentieth century. 2 3/8” for old pine floors. Or any width to match an architect’s spec or existing of nonstandard width. And up to 8” wide for wide and long plank flooring. Our standard lengths are 1’-7’ nested together but we can supply, within the constraints of our raw material 2’ – 10’, 3’ and longer, or even longer minimum lengths for jobs covering large, open areas. From microbevels to give a plank floor more definition to side and end bevels of varying depths to match existing floors from long-shuttered manufacturers, we can create the bevel you need in place of square-edge flooring. Send us a drawing, or better, a sample from existing so we can exactly match what you require. Double- end grooved herringbone can be manufactured in virtually any standard width and length. From yellow poplar to sassafras to reclaimed heart pine, we can quote any kind of wood commercially available, and even a few that are hard to source anywhere on a commercial basis. We are specialists in American hardwoods, so we find it best to leave overseas species to specialists in those woods.